A kirdan or bridal necklace from northern Jordan mounted with British, Ottoman, Egyptian and Byzantine silver and gold coins, attached to a black band with blue and coral beads on a filigree plate with a crescent. The coins date from the 1880s to the latest, a George V gold sovereign. The coins would have been presented at key moments during an adult woman's life; marriage, births of children and other significant events. 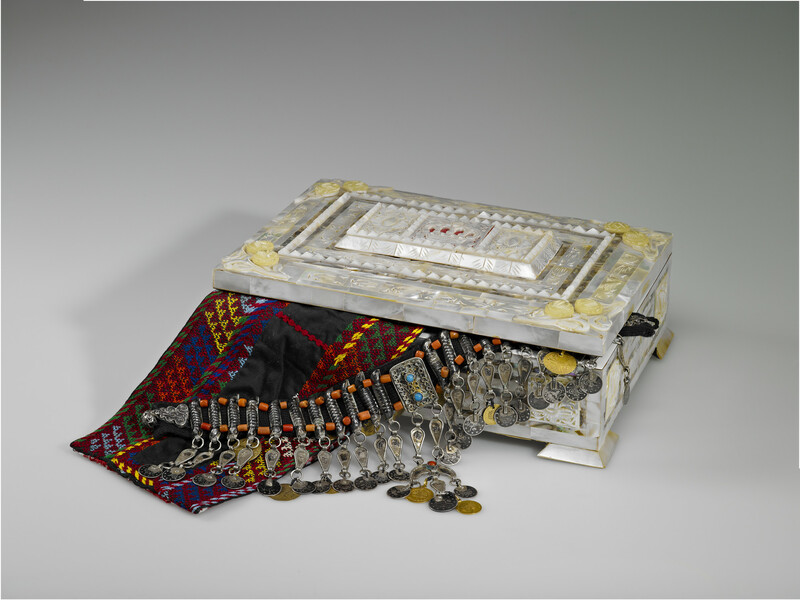 With accompanying embroidery from the hem of a costume from c.1880, and a mother of pearl casket from the Red Sea carved in the traditional Bethlehem manner.